One of our favorite hikes is the Black Mountain Peak loop! Our whole family joined in for this one. Starting at the Virginia Lakes in the eastern Sierra, we hiked up the wilderness trail for a few miles and then turned at Green Lake to hike up flank of Black Mountain. I still cant believe how AWESOME the views are!! From any of the 3 peaks that we climb on this hike, you can see into Yosemite, east towards Bodie ghost town and Mono Lake, down into Lundy Canyon, and on and on. Here's the loop as seen on Google Earth. The actual hiking varies from shale climbing, to a popular hiking trail, to jumping and skipping down the steep slope of pure shale. Good boots really help on this one! Its hard to tell, but in the picture above, i'm hiking with my dog on the flat part of the ridge. Just an indicator of how massive this area is. Thats Mono Lake in the background. After hiking the Black Mountain peak, we descended along this ridge and then climbed up to the top of Mt Olsen. One of the most fun parts of the hike is the descent back down to the lakes. We traversed around until we could find some of the smaller and looser chutes of shale. Then we just jumped and slid the whole way down! After a full day of hiking, we were back down in less than 10 minutes. It was super hot at 10,000 feet, so we ended the hike with a refreshing jump in Red Lake! 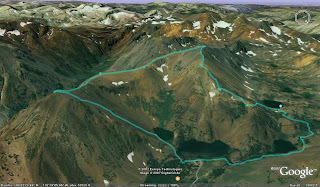 GPX file of the hike is here.